*All information is valid as of the start of the 2018 season. The main team playing at Jingu Stadium is the Yakult Swallows, a Japanese professional baseball team that plays in the Central League. Various college baseball games are also played at Jingu Stadium and every summer there is a major fireworks festival. Watching the fireworks from inside the stadium requires a ticket but the surrounding areas are free to enjoy the fireworks. From the Ginza Line, go to Gaienmae Station. Head out exit 3 and head right, along the street, to the main gate. If you choose the JR Sobu-Chuo Line, there are 2 stations to choose. From the east, it is faster to get off at Shinanomachi Station. Head out the main exit and turn left. Then, head left out of the exit and cross the street using the pedestrian overpass. On the other side of the street there is a small hallway through a small shopping complex. Go through the complex and turn left. At the next street, turn right, and then turn left. Coming from the west, it is slightly faster to go to Sendagaya Station. Head out of the exit and you will see a police station on the left at the intersection. Go east at the intersection and keep going straight. Keep right at the fork to get to the stadium. Both Shinanomachi and Sendagaya Stations take a route to the outfield entrance of Jingu Stadium. For the Oedo Line, the easiest station to go to Jingu Stadium is Kokuritsukyogijo Station. Head out exit A2 and turn right. Keep going straight and keep right at the fork in the road. This will lead to the outfield entrance of Jingu Stadium. If you are coming from the south, Aoyama Itchome Station is also available. Head out exit 1 and go straight. At the first light, turn right and keep left. This will lead to the outfield seats of Jingu Stadium. There are many seats available at Jingu Stadium. The area behind first base is the home side and third base is the visitor’s side. While seating in the infield is available to fans of both teams, it is highly recommended that you choose seats for your corresponding team. Seats behind home base are safe for either team. 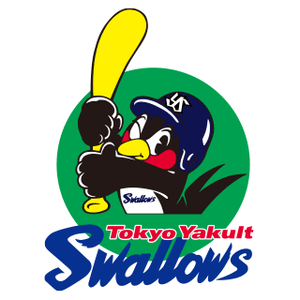 Note: Yakult Swallows has 3 tier pricing (Value バリュー; Basicベーシック; Premiumプレミアム) based on the date and opposing team of the game. The majority of games are in the Basic price range. If you have free seating tickets, it is best to arrive early if you are in a group. Doors open approximately 2 hours before the first pitch. Be sure to enter the proper gate if you are a fan of the home or visiting team. There are also extra areas at the very top of the stands for people to lay sheets for a picnic style evening at the game. These are often taken once doors open. For weekend and major holidays, free seating areas fill up very fast. Arriving before the gates open is advised in order to get decent seats. Generally, Gate 16 has more seats available while seats at Gates 14 and 18 tend to fill first with the most diehard fans. Gates 1, 18, 17, and 16 are for the home team free seating section. Gates 13-16 are for the visiting team section. Walking around the entire stadium is possible, even in the opposing team’s colours. Baseball tickets in Japan can be notoriously difficult to purchase in English. For Yakult Swallows games, you can purchase tickets directly from their homepage. Tickets can be purchased online and picked up outside Gate 7 on the day of the game. If you can read Japanese, you can purchase tickets at any convenience store in Japan. 7-Eleven shops are best as they do not charge any handling fees. If you can’t read Japanese, you can always print out a seat map and see if one of the store clerks will help you. It is probably better to go to Harajuku to get tickets in this case. Same day tickets can be purchased at the box office behind the main grandstand. There is also a ticket office behind Gate 17 in the outfield. Games generally don’t sell out but be aware that popular teams may sell out on weekends and holidays. It is best to check availability ahead of schedule. 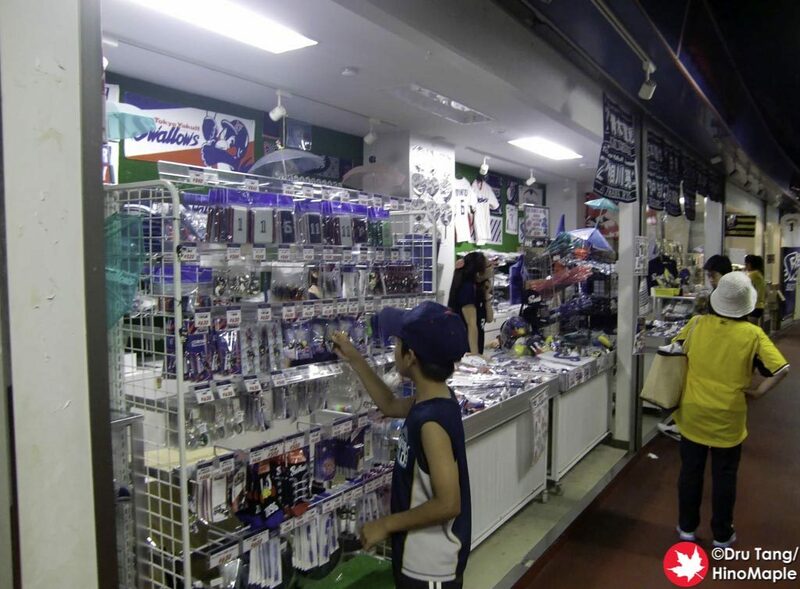 Jingu Stadium has many merchandise shops around the stadium for both home and away teams. There is a Yakult Swallows specialty shop located next to a batting centre between the JR Chuo-Sobu Line stations and Kokuritsukyogijo Station and Jingu Stadium. Outside the outfield are also a few shops for the Yakult Swallows that are open for game day only. If you are Hanshin Tigers fan, there is a specialty shop located between Gaienmae Station and Jingu Stadium on the right. 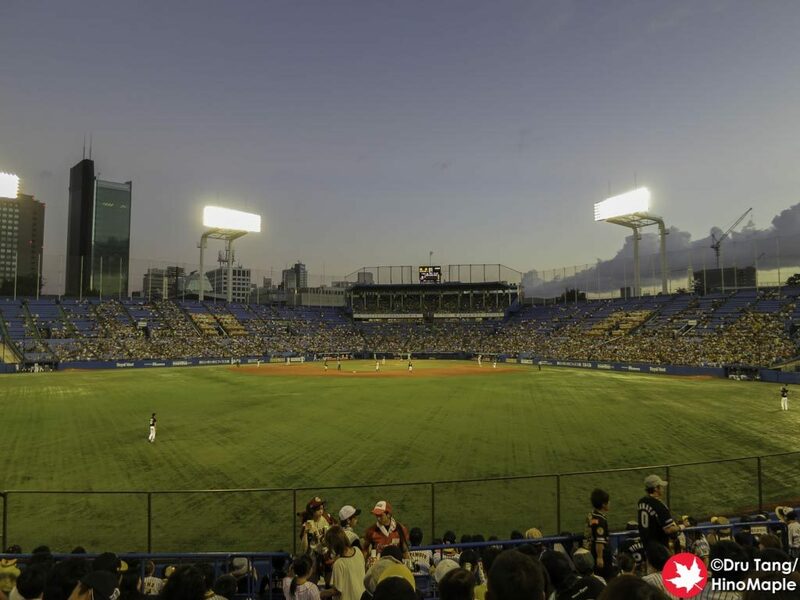 This entry was posted in Stadiums and tagged baseball, japan, Jingu Stadium, Meiji Jingu Stadium, Nippon Professional Baseball, Yakult Swallows by Dru. Bookmark the permalink.